Yes, that's the salutation from the Doctor that will greet you once you've been enticed into the dark recesses of BBC Worldwide's Doctor Who Experience currently occupying Kensington Olympia this summer. It's an impressively scaled interactive exhibition, offering a cornucopia of props, costumes and behind the scenes ephemera from over 40 years of the good Doctor's adventures and a prefect day out for Doctor Who fans young and old. My journey on this half hour 'walk-through' experience was in the company of several fanboys and fangirls, all nervously lining up and waiting for the show to begin, unaware of what to expect. Surrounding us were the merest hints - a new series Silurian on guard and a rather fabulous tableau featuring one of Churchill's khaki Daleks - to the feast that would greet us once we'd been given a video pep talk by the Doctor himself. 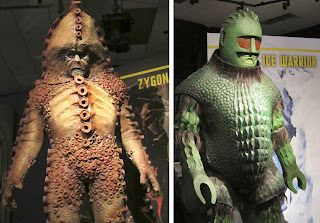 As the Doctor's introduction concluded, advising us of the terrible threats to our safety that the crack in the universe would disgorge, the huge video screen we were watching thrillingly split open and our little party found itself in the National Museum aboard Starship UK. All the visual and aural details of The Beast Below surround you, highlighting each of the objects in the museum. It's at this point that the 'experience' cranks up and the walk-through proper begins with the Doctor interrupting the broadcast to advise us that he needs our help to free him from imprisonment in the 'spare' Pandorica his deadliest enemies had lying around (a cheeky bit of knowingness that's one of many instances where you'll detect Steven Moffat's hand in the general tomfoolery). His plea for help concludes when the TARDIS materialises and, if you're a sad old bugger like me, it truly is a shiver down the spine moment when it appears and the Doctor invites us in through the front door. 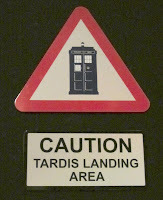 The police box doors lead into the lofty vaults of the current TARDIS interior, impressively re-mounted for the show. And what's even better, you get to navigate, run the diagnostics and take off and then land the old girl with the Doctor's help! Some nifty hydraulics under the floor make the journey a physically real event to his not-so-reluctant passengers too. However, the Doctor's not entirely pleased that the old lady on her way to Sainsburys or the tourist just back from Carnaby Street have joined the party. Never has a shopping trip been so urgent. 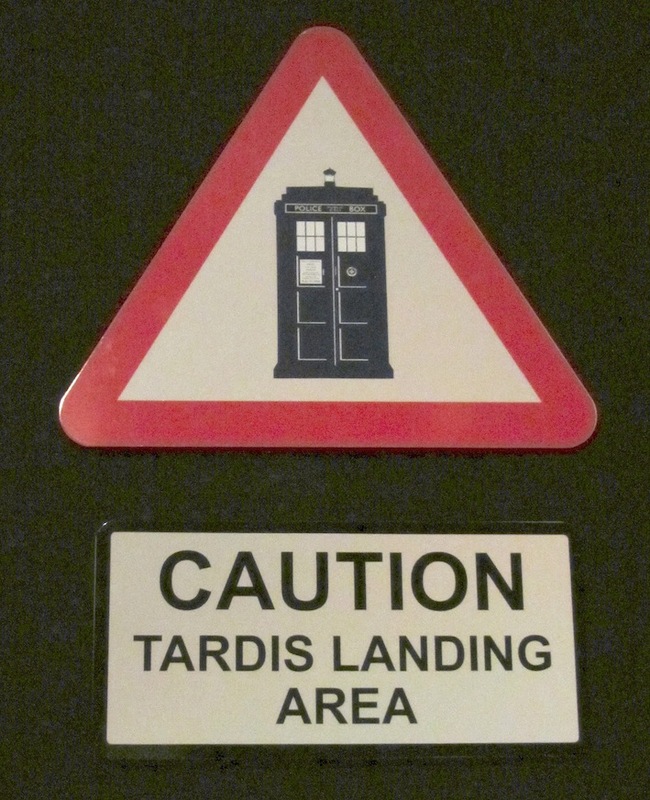 Oh, and if you are follicly challenged then you'll have to take some 'bald' jokes in good nature as the Doctor seems rather concerned the TARDIS's landing might turn you into a chicken. Pay attention to the walk-through's script as it's full of cheeky little asides like this. Naturally, once the ship has landed, it's time to scuttle down dark corridors, surely the epitome of any Doctor Who walk-through of this nature (more like a run-for-your-life-through), but you then find yourself cornered inside the control room of a Dalek saucer, complete with those fan-pleasing, appropriate sound effects throbbing all around you. Paradigm Daleks (and yes, they are big, rather daunting variations on the original Cusick theme) rant at you, threatening to vapourise you and your shopping. The Doctor intercedes on your behalf but the Paradigm Daleks are suddenly attacked by... well, that would be giving it away. Suffice it to say, if Moffat's planning something big for the Daleks then what you witness on screen in the control room might well give you a hint of the notions going on in his brain. Or perhaps it's a bit of misdirection again. Half expecting the Daleks to actually chase after you down the corridor (now that's what I would definitely have called an experience), you and your party will then find themselves hurrying through a decaying forest surrounded by Weeping Angels where strobe lighting effects and warnings from the Doctor not to blink certainly get the pulse racing. By about now I also expect any little ones to be equally scared and excited as it's surely the stuff of nightmares being harangued by Skaro's finest and a forest full of living statuary, in the dark... unarmed... that even had me slightly concerned about w-w-whatever that was behind us. Our gang of shoppers make it to the Underhenge and a rather spiffing 3D experience with Cybermen and Daleks leaping out of the screen at you. Mind that plunger, dodge that laser fire! Apparently all our efforts have been enough to free the Doctor from the Pandorica and he triumphantly returns to the TARDIS, which then makes me want to run all the way back through the experience and back to the TARDIS to see if he's actually there. Well, some kids are bound to ask, aren't they? What's really striking is how Matt Smith himself has utterly embraced this idea and, through his appealing performance on the various video screens, he confirms what a startlingly good choice he was for the part and how well he's shaping up as one of the series's greatest ambassadors. Leaving the Pandorica behind, you'll be greeted by a whole floor devoted to the past and present Doctors and their many adversaries. All eleven Doctors' costumes are beautifully presented (how many of them are original props and how many are specially re-created is difficult to assess) with the Matt Smith geography professor look du jour sitting centre stage with a TARDIS prop. Mind you the dummy proudly wearing Smith's clobber does the poor man no favours whatever. But it's lovely to wistfully cast your eyes over the collective Time Lord fashion statements that include a cosmic hobo, a Biba inspired dandy, the one with the teeth and curls, the cricketer, the one with bad taste and the hard nut in the leather jacket. 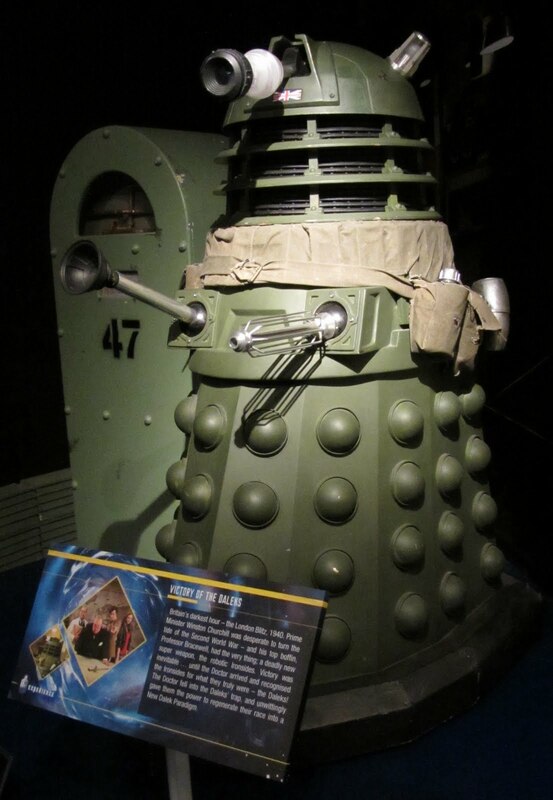 And check out the array of sonic screwdrivers and TARDIS keys on display while you're at it. 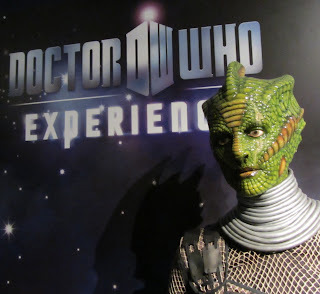 Here, you can also indulge in a bit of green screen photography and drop yourself into the current TARDIS console room and have a snap taken before moving on into a room full of props and costumes that also features console rooms past, including wonderful tableaux of the Tennant-era and Davison to McCoy-era TARDISes of the original series. The Tennant variation is the perfect photo op, allowing our rag-tag band of shoppers to pose in front of it with childish grins on their faces. You see it's not just for the little kids, it's also for the big ones too, happily plundering the Doctor Who back catalogue and indulging in nostalgia on tap. 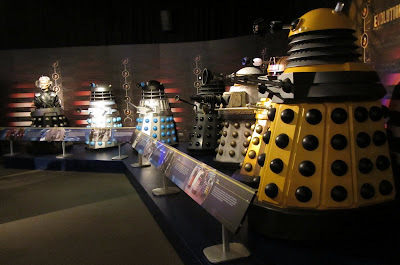 Plenty of Daleks to ooh and ahh over, including their mate Davros and a bold comparison between the earliest incarnations, all squat and sleek, and the massive, hump-backed behemoths of the present day. 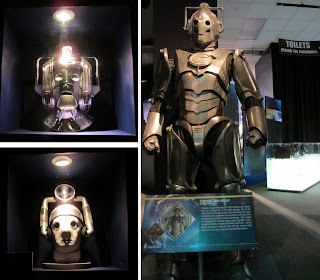 Another delight is the wall of Cybermen masks too, their blank faces looming out at the curious. What's particularly pleasing is the mix of eras that are represented here, with a carnival of monsters from the past, including Ice Warriors, Sontarans and Zygons, standing shoulder to shoulder with those latest emblems of psychological terror, the Silence. 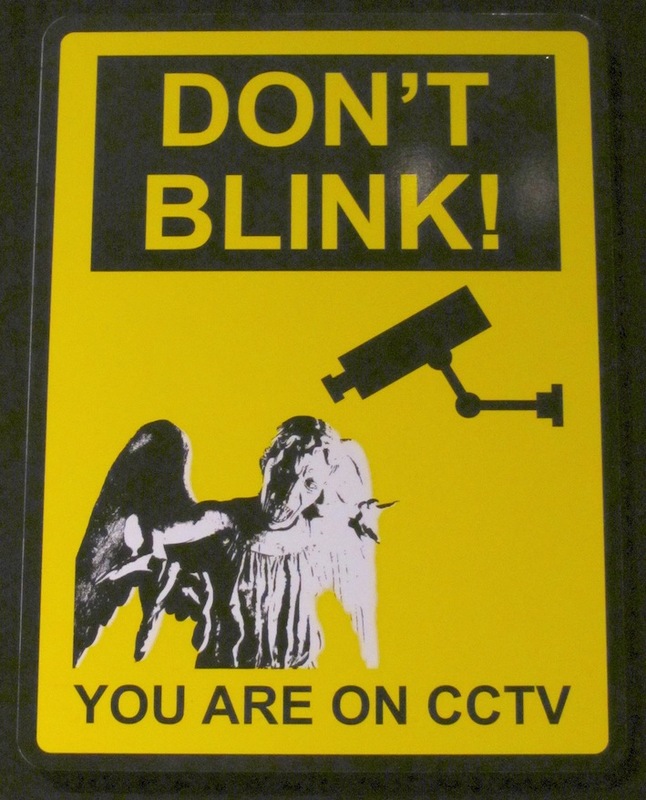 Oh, and if you're not coping too well with the onslaught of meanies and need to spend a penny, the toilets are behind the Pandorica. Again, the emphasis is on the interactive. Want to walk like a monster? 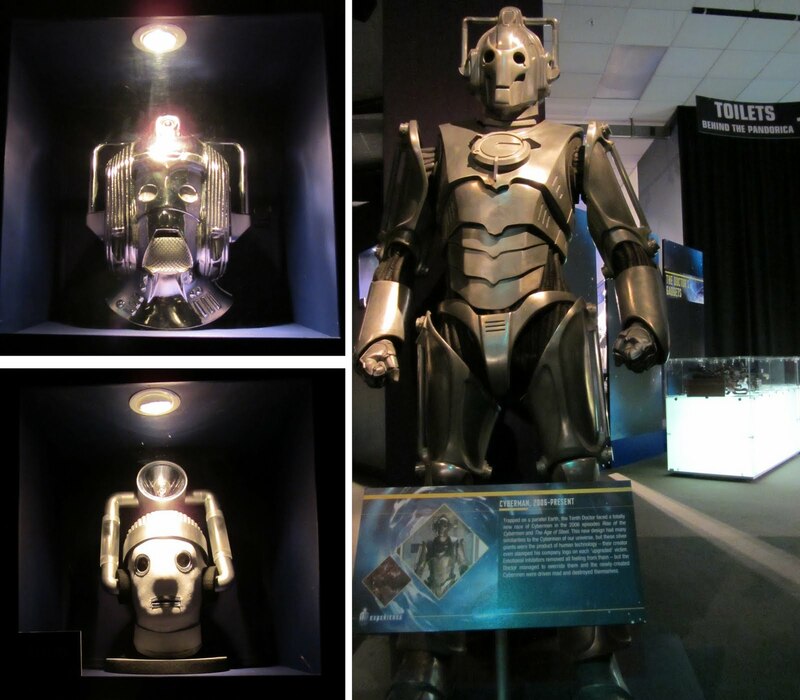 Pop into Ailsa Berk's 'monster movement' academy and stomp about like a Cyberman to your heart's content. Fancy filling your ears with bizarre BBC sounds? There's a whole section devoted to the sound department and its trickery and you can push buttons, listen, watch and learn. The exhibitions are well designed and the interpretation of various objects, costumes and props is clearly presented and researched. 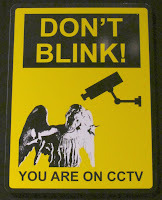 Look out for the witty bits of signage, even more of the Silence hanging from the ceiling and a full size Dalek to try out. If you need a bit of a sit down, and let's face it heaving your shopping bags round this maze and fighting off Daleks and Weeping Angels can be exhausting, a screening room also offers an insight into the making of the series. There's a well stocked shop and, although I was slightly disappointed that the focus was almost entirely on the current series and had been thwarted in my quest to pick up that Classic Series Sontaran and Fourth Doctor set, it will entice you to part with enough money to cover the national debt of a third world country. There's a very nice, glossy, fully illustrated brochure available too and at the moment it's discounted when you buy an Experience t-shirt. All in all, a lot of fun and a perfect excuse to take the kids out to something that secretly you're dying to see yourself. Book well in advance as I imagine it'll be busy over the summer holidays before it makes its move over to Cardiff later this year.